The flag of the state of Rhode Island features a white field and consists of a gold anchor in the center (a symbol for hope) surrounded by thirteen gold stars (for the original 13 colonies and Rhode Island's status as the 13th state to ratify the Constitution). Our Rhode Island Flags are 100% made in USA and carry 6 months guarantee on construction. Made to the highest precision and perfection, these custom flags make a great way to celebrate the state pride and the maritime legacy of Rhode Islands. Shop from our complete line of Rhode Island Flags right away and avail the best prices, quick shipping and much more! 100% customer satisfaction guaranteed! Our Rhode Island Flags are offered in all the standard sizes and in two material choices of 200 Denier nylon and polyester. Made to the exact specifications of the official flag, our Rhode Island Flags are finished with headings and grommets and feature colorfast Dupont inks to ensure a vibrant flag display. 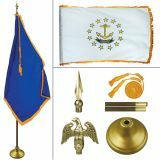 Choose from outdoor flags, indoor flags or indoor flag kit that makes perfect gifts, collectibles or display items. 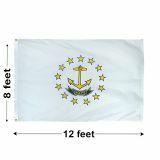 Browse our complete line of Rhode Island Flags at attractive rates. Should you need any assistance, call our toll free number (888) 287-3524 or email at customercare@tuffflags.com.